February 14, 2008 at 2:32 am our sweet Belle came into our lives. She was a healthy 7.6 pounds and 19.5 inches long. She had curly dark hair and big dark eyes. From that minute on she became our special Valentine! Belle is a well rounded little girl. She can pinch her brothers and turn around and hug them, all in the same minute. She can be a tomboy, right there in the mud or race around yelling. She can be a little diva in her frills and ruffles and jewelry. She can be a momma, taking care of all when someone she loves is sick or hurting. And she can be the little girl with the little curl, right in the middle of her forehead. But however she is, she’s our Belle, sweet, mean, mad, crying or smiling. Belle’s mom says she’s a lot like me. I don’t know yet. There’s some ways I hope she is and there are a lot of ways I hope she’s not. We don’t really look alike but we both have curly hair. We can be mean girls. We can be nice girls too. We both love shoes. She even has a baby shoe rack hanging on the inside of her closet door and knows which pair she is going to wear, whether her mom agrees or not! She likes clothes and already knows to sqeee in delight at something pretty. She decides what she wants to wear and there’s not a lot of compromising. She knows what she likes! I think we will probably be good shopping buddies when she gets older. I know that whatever comes, she’ll be my sweet Belle, my baby girl and my beautiful friend. Happy birthday ma Belle amie! Mamye loves you! That you amaze me, by leaving me now. Ma belle amie, I'm in love with you! 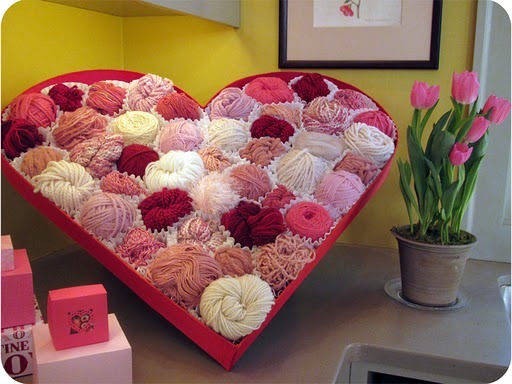 Now wouldn’t you want to get this for a Valentine’s present? Well, not unless you like yarn! But I sure wouldn’t mind having it. I wonder if I could make one. Creative! It’s February 10, day 316 and I’m so relieved to be home. I’m still just tired and could stay in bed all day I think. Won’t get the chance but it’s good to be back. I chose thick aqua twisted with gray. Back to it today. It’s day 317, February 11, and it’s a peaceful day at work. There are not many people there and I can get a lot done. Leftovers in the break room for lunch so that’s good. Then Alan brought more leftovers for supper from another luncheon. All is good! I picked sinfonia blue variegated for today. I’m working on Saturday, day 318, February 12. It’s cold but they did remember to leave the door unlocked so I can turn the heat on for us. I’m content to get some work done and listen and hope my intern listens so he can pass his test! We end early and I’m able to take my friend for a late birthday lunch. It’s a good day. I chose a tan and white nubby yarn for today. Day 319, February 13, and I sleep late, again. I just can’t seem to get caught up. Or maybe it’s some new medicine. Anyway, when I finally get around I don’t do much. I should have gone to a funeral for a young man who used to live across the road from me. But it was just so sad I couldn’t do it. He was a soldier and it’s not known what happened yet. It’s just sad that such a young life is ended so soon. I choose camo yarn for him today. Day 320 is Valentine’s Day. It’s February 14 and my sweet Belle’s 3rd birthday. I can’t believe it’s gone so fast. She makes me feel loved. I choose pink worsted because pink is her favorite color. I want her to grow up and have everything she needs and most everything she wants. I want her to be kind and considerate, honest and headstrong in a good way. I want the best for her. Spread out to see the pattern. thanks for the smile this morning...Belle is one lucky girl to have you as her nanny...enjoy her and your other beautiful grandchildren...You are a lucky lady! oops, wanted to tell you that I love the cowl...love the pattern and the color is yummy! Will be beautiful on you! Thanks Brenda! I'm the lucky one! I'll block the cowl and see what happens. 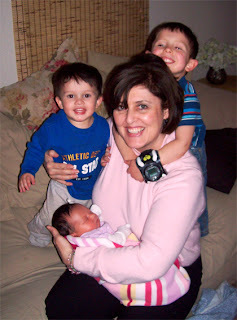 I love the picture of you draped in the kiddos - precious! What a precious picture of all of you! Belle and the Boys are definitely lucky to have you as their Mamye. What a gorgeous picture! And a beautiful baby. Congrats! Thanks for the nice comments on the picture! I don't usually like pictures of me but those babies make me happy!